If you cannot make AirParrot working on your Windows or Mac OS, or want to get a free AirPlay solution for video audio streaming, the free AirParrot alternative recommended here can exactly meet your needs. This AirParrot substitute named 5KPlayer is capable of free streaming video audio music for Apple TV, iPhone (SE/6s/6s Plus/7/8/X/XS/XS Max/XR), iPad/iPad Pro iPod, AirPlay-enabled speakers and more. It works without connection errors, video audio quality loss issues or other problems. How to Stream Video Audio with AirParrot Alternative? It is advisable to take 5KPlayer as the AirParrot free alternative. 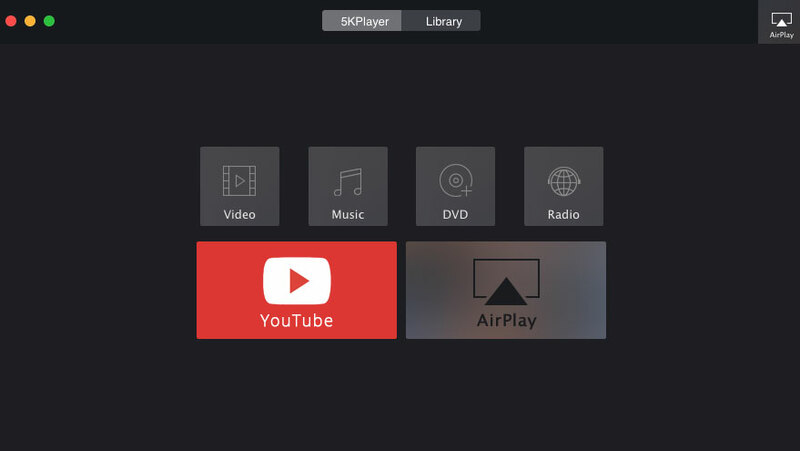 Free as it is, the AirPlay feature built in 5KPlayer is powerful to stream movies, video clips, audios, music songs from iPhone/iPad/iPod to Mac/Windows, from Windows/Mac to Apple TV, computers, etc. Why We Need AirParrot Alternative? AirParrot is a paid media streaming application for Windows and Mac. With this tool, users can mirror and stream video audio files from PC, Mac or Chromebook to Apple TV, Chromecast and more. Despite that, sometimes we feel fully justified in needing an AirParrot alternative. 1. We Need an AirParrot Alternative Because We Want a Free AirPlay Solution. "We want to use Apple TV to broadcast our Windows machines to our HD TVs. We have found AirParrot but it would be expensive to have that on all our machines. Does anyone know of an open source or cheaper alternative to AirParrot?" 2. AirParrot Alternative is Required Because AirParrot Cannot Connect My Devices Well. "Please help me connect my AirParrot to my Apple TV. It just says not connected and it doesn't find my Apple TV. My computer is Mac OS X Lion 10.7.5 (11G63)"
3. AirParrot Alternative is Necessary Because AirParrot is Unable to Stream Video Audio with Good Quality. "I am looking for an AirParrot substitute because I have run some tests on it and found that movies I played through AirParrot to my HDTV via my ATV3 are quite choppy and the audio is unsatisfactory." 4. AirParrot Alternative is a Good Option When AirParrot Has Compatibility Issue with Your Operating System. "I am running Windows 8 x64 and am unable to run AirParrot (an application for mirroring your PC screen to an Apple TV. I tried to "check for compatibility" but that did not work. Any advice?" Don't worry. AirParrot is not the only option for videos audios AirPlay. Here, you can get the best AirParrot alternative, namely, 5KPlayer. 5KPlayer is a piece of mixed multimedia software coming with built-in AirPlay feature. With this feature, users can free stream videos, movies, TV shows, music and songs from iPhone (SE/6s/6s Plus/7/8/X/XS/XS Max/XR)/iPad/iPad Pro/iPod to Mac/Windows, from Windows/Mac to Apple TV, AirPlay-enabled speakers, Windows/Mac, etc. It runs well on Windows 10 and Mac OS (OS X 10.11.4 included). And it is able to detect available devices and connect them easily and quickly, and deliver video audio without quality loss. Step 2. Set AirPlay on your iPhone/iPad. Find the "AirPlay" option in the Control Center on your iPhone/iPad display. And click "AirPlay". Step 3. After you tap the "AirPlay", you will see a list of AirPlay receivers. Then all you need to do is find and choose your computer and click "Done". Step 4. Play the video or audio on your iPhone/iPad/iPod, and then it will be streamed from iOS device to PC/Mac immediately. AirPlay of 5KPlayer supported video audio formats include MP4, M4V, MOV, MP3 and M4A. If your multimedia files are not accepted by AirPlay, you should get help from DVD video converter software for Mac OS or for Windows PC firstly. Note: Serving as the best AirPlay receiver and sender, 5KPlayer is the best AirParrot alternative capable of delivering excellent performance in streaming video and music by AirPlay. Moreover, 5KPlayer not only acts as AirPlay streaming software, but also accompanies with the ability to play video music in various formats and download online videos music from 300+ sites. How to AirPlay HTC 10/One to Mac/PC/TV? HTC AirPlay marks the first time ever that AirPlay Android phone out of the box is available. How to AirPlay HTC phone? Here we list top 5 Beamer alternatives in 2019 for you to stream any type of video wirelessly to TV from Mac/Windows.